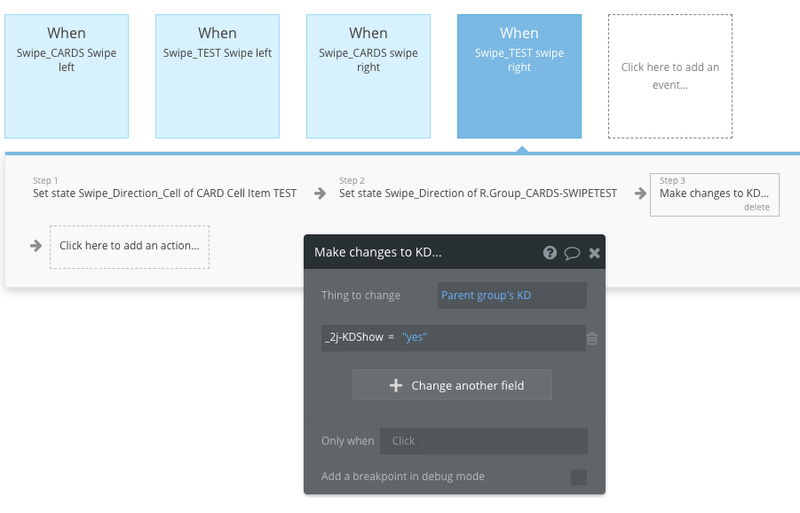 I change one Parameter (KDSHow) in the PARENT GROUP KD for the current cell (**). 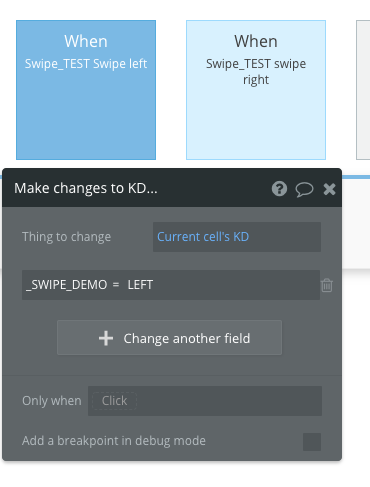 And the thing is the Workflows change the KDSHow field to YES or NO (depending of the SWIPE direction) but to the entire DataBase. It looks like PARENT GROUP KD does not work properly. Any idea to solve this bug? By the way is it a Bug or is it wrong parametererization? (*) RIGHT makes the CARDS green and LEFT makes the CARDS RED. I know that SET STATE Parameter changes color for all the CARDS. So it’s not the issue here. (**) KD is the name of my DataBase. KDSHow (YES or NO) is a Flag in each item that I change within the WORKFLOW. When Swipe is RIGHT then KDSHow is YES and when Swipe is LEFT then KDSHow it’s set to NO. you can’t use custom states to tell which card should be green yellow etc. You need to write it in the database for that specific item shown in the cell, and then have a conditional formatting for the cell that would say “when current sell’s color is green” change the background color. (in this case i used “color” as the database field in the same table from where you are retrieving records to show in the repeating groups. Custom states are global parameters not specific to a certain cell. 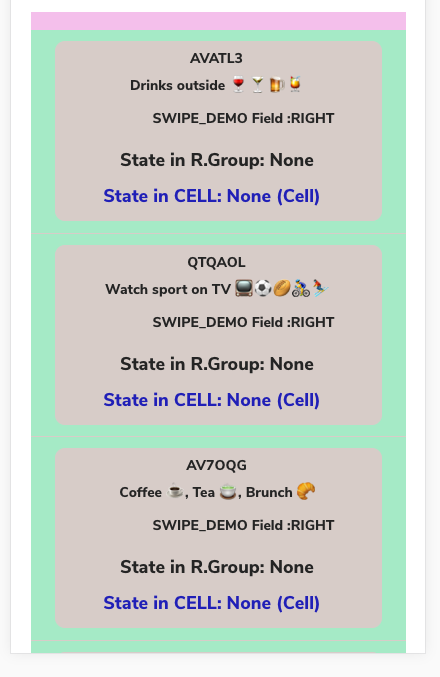 PS: I have tested to put the SWIPE PLUGIN at the repeating Group level and at the CELL level and unfortunately the results are exactly the same. Can you add [email protected] to your application, so one of our Developers will check you app. Have you seen my PM message with my contact details? Hello @3whiteshirts, thank you for reaching out. 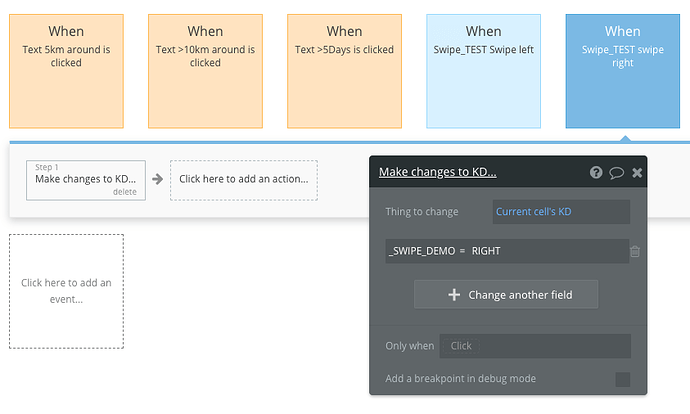 We made a minor changes to the plugin and fixed your demo. 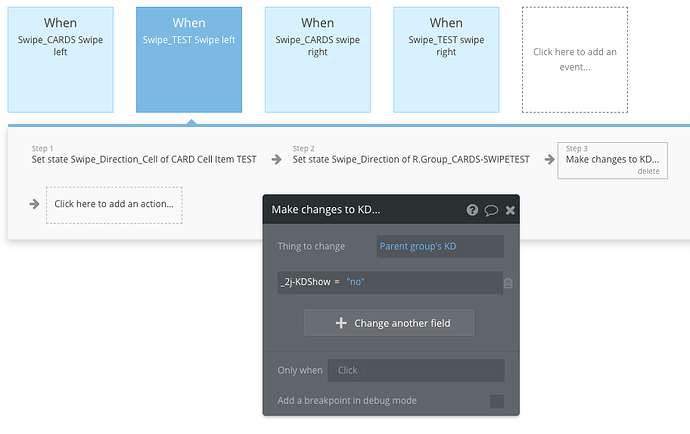 Added dynamic data option to use elements ID’s and it fixed issue with repeating groups. Thanks Pavel and Zeroconde team for your support. 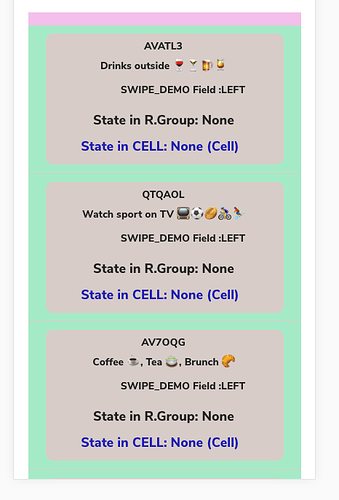 The Swipe is at the Cell level now. Very good. Any chance to get a kind of threshold to adjust the SWIPE behavior and make it much more usable… As from now, I cannot use it like that… Too much sensitive. Added new functionality and a new field - Sensitivity. Touch sensitivity in pixels. The less the number is, the more sensitive it will be. This is an excellent feature which was really needed to make the Plugin usable. Thanks for your efficient support and reactivity. This is appreciated! "SWIPE TO WORKFLOW ACTION is the unique SWIPE Plugin which works at the Repeating Group Cell level. 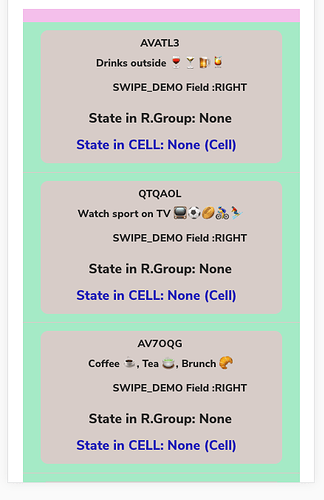 You can scroll down or up in a Repeating Group and select each CELL by swiping Right or Left. Very useful ! 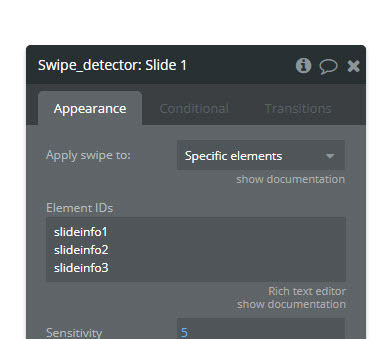 Sensitivity Parameter is also a very good feature as we can now adjust to the movements of the fingers. I recommend this Plugin. " 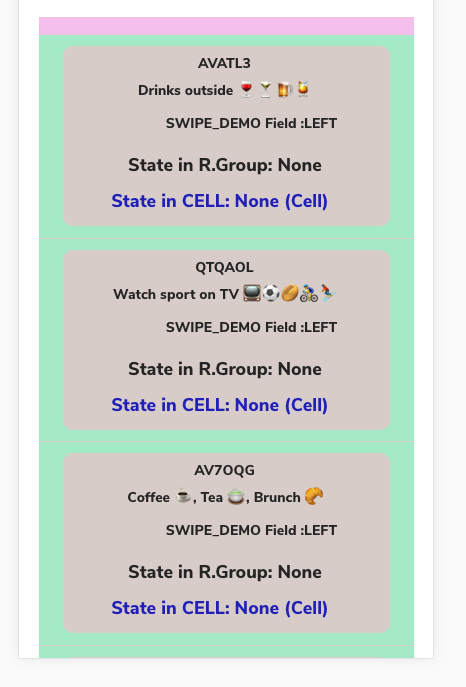 In the list of CARDS, every time I swipe LEFT I change a field flag and the CARDS does not appear in the Repeating Group. Great. But, as I want to show a nice looking SWIPE LEFT movement effect, I have added in the workflow a ANIMATE SwipeLeftBounce (for example). thanks a lot for the kind feedback, really appreciate it. Hi Omar, did you try to list the element IDs separated with a coma? Fixed unable to add multiply ID. Elements ID must be inserted separated by a comma. Added New element, Press&Hold Detector. Detects when selected element is pressed and hold, then is triggered event, Element Hold. Elements ID, also must be separated by a comma.